Everyone knows that nobody does hybrids like Toyota. Since its introduction, the Toyota Prius has dominated the segment. Offering class-leading fuel economy, a sporty performance and must-have interior tech and features, it’s no wonder that environmentally-conscious drivers opt for the Prius time and time again. After a significant exterior makeover for the 2016 model year, the new Prius is sportier than ever. Its exterior features a new, more aerodynamic shape and an aggressive front fascia that is a force to be reckoned with on the road. Despite its tougher look, the Prius is lighter than ever, offering even further improved fuel economy, making it a practical choice for commuters and families on budgets alike. 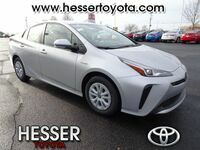 Those interested in getting behind the wheel of an affordable fuel-saver, will be happy to know that the new 2017 Toyota Prius in Janesville, WI will be available here at Hesser Toyota. Click the button below to view our full new Prius inventory! Otherwise you can see a few of our available models below! The 2017 Toyota Prius has the sporty performance to match its new, striking exterior. This is thanks to its 1.8-liter, 4-cylinder engine that’s paired with either a 207 V lithium-ion or a 202 V nickel-metal hydride battery to produce 121 horsepower. Additionally, this setup with its hybrid powertrain is what makes the 2017 Toyota Prius able to achieve an outstanding 54 city / 50 Hwy MPG. If you’re interested in getting behind the wheel of the new 2017 Toyota Prius, be sure to check out our inventory here at Hesser Toyota. We’re always happy to help our customers find the model that suits them perfectly, and if you think the new Prius is the car for you, we’ll help you get in one! After you’ve taken some time to go over our inventory, give us a call or schedule an appointment here on our site to stop by and take the model of your choice out for a test drive. Don’t see the model you’re looking for? No problem! Just contact us here at Hesser Toyota and we’ll look into getting the exact car you’re looking for, and be sure to notify you as soon as it arrives on our lot.